The second topic (unit) of the ccourses MOOC (Connected Courses. Active Co-Learning in Higher Ed) is Trust and Network Fluency . Each unit in ccourses lasts for two weeks. For me this is good. For those who want to do a lot of reading – and there are plenty of resources listed on the ccourses site – then there is time to do this. For those, who simply want to interact with others, or think about the topic and reflect on it, this is also good. Reflection takes time as we can see from Mariana’s blog post in which she reflects deeply on trust, privacy and interaction in networked environments. It is a great post and has prompted me to respond, but also to add some of my own thoughts. 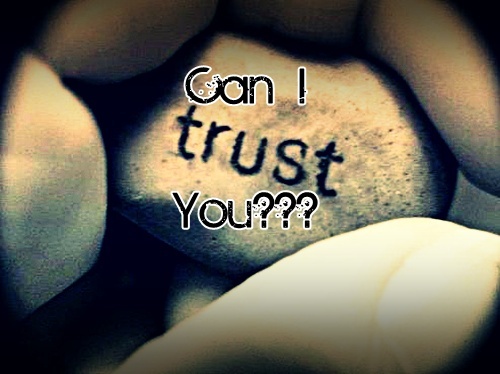 What happens when trust breaks down in online relationships? At the very worst level your life or career can be destroyed as in the case of Kathy Sierra – but even at the level of just one relationship the damage can be irreparable. (See Kevin Hodgson’s blog post). We don’t trust each other (and we shouldn’t). Spam, viruses and phishing are the most manifest cases of this sort of breach of trust. Consequently, we have attempted to create walls around ourselves – spam filters, social network buddy lists, so-not-call registries. We seek control over the flow of information into and out of our systems through technology over which we have less and less control (because of the needs of the other forms of ‘trust’). Give up control. Keep in step with each other. Is that possible? In our research into emergent learning, trust is one of the factors we consider to be essential for emergent learning in open learning environments. We discuss it in terms of the tension between competitive self-interest and mutual respect, support and growth. Perhaps it’s competitive self-interest that we must give up, rather than control. Competitive self-interest can lead to voices that are ‘too loud’ in the online environment. 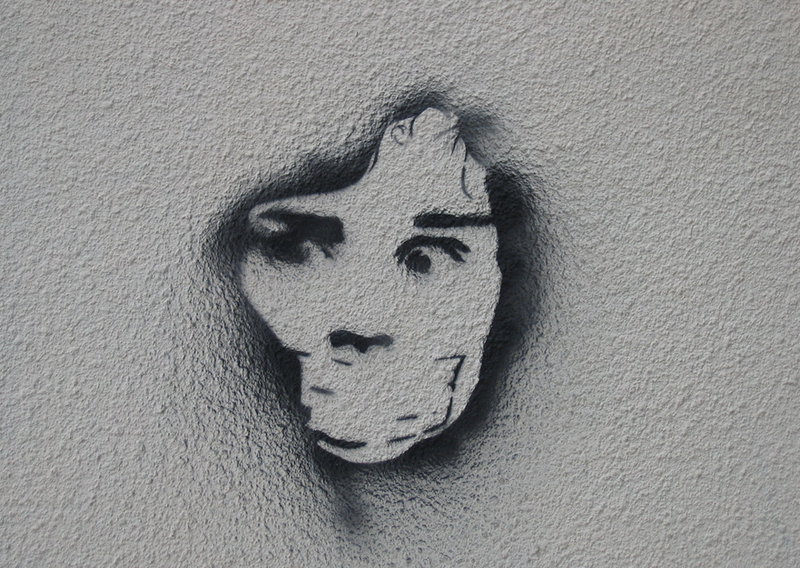 Mariana writes about the ‘silencing’ effect that some online personalities can have, either through overt harassment or simply by being over-present and dominating every conversation. How do you cope with the person who is not overtly harassing, not a troll, but whose voice is too loud in the online environment, given that people’s perceptions of what constitute a loud voice differ? This is something I used to discuss with teaching colleagues in the past when we were just beginning to run online courses. i.e. how present should we be as online tutors and what should we do about the over-present dominating student. Gilly Salmon describes this type of student/online learner as ‘The Stag’ and suggests giving them a job to do, which keeps them busy enough to prevent them from ‘spamming’ their fellow students. But not all dominant voices online are students. What of those everyday users of the internet who are trolls or who are simply always ‘in your face’; then the only alternative response is to walk away, as Kathy Sierra has done, or ‘unfollow’ or ‘block’ i.e. to disconnect. But where does this leave the development of skills of systemic dialogue that Mariana talks about? The more choices to be ‘public’ one makes, the more likely one will find people who disagree with one’s world view and are unable to engage meaningfully with disagreement. The open web does not come with a built in facilitator to teach people the skills of systemic dialogue. We need more meaningful dialogue and less shallow answers. Trust should not have to mean always agreeing with each other and establishing cozy echo chambers. In fact quite the opposite. The people I trust the most both on and offline are those I can speak my mind to and who will engage with me in what I perceive to be meaningful dialogue. They do not have to agree with me, but neither do they attack me. There is as I mentioned above, mutual respect, support and growth. Negative stories carry more learning than positive stories. Appreciative Inquiry is often unethical and used in inappropriate contexts; it tells people what stories they are allowed to tell. Open space is also like this in that it rewards consensus and punishes dissent. Anyone who survives in an open space does so because the only people there are those who listen – everyone else votes with their feet. So trust in the online environment is a complex issue. It should not be taken lightly. I agree with Gardner Campbell – trying to explain why I teach feels like an impossible task. Not only is there the underlying assumption that we all know what we mean by ‘teaching’, but my many years of teaching experience seems to make the task harder. There are so many ways in which the question could be answered. Also, like Gardner Campbell, I can remember clearly the exact point at which I realized I wanted to be a teacher. I was at University in my first year studying physiology. Those were the days of chalk and talk. Hundreds of students in lectures looked at the back of the lecturer as he wrote in chalk on a blackboard and we frantically tried to copy everything down. But for physiology we also had a seminar group and we were tasked with giving an individual presentation (no such thing as group work in those days) on a topic of our choice to the rest of the seminar group. We were not given any advice on how to do a presentation. My topic was ‘pain’, i.e. the physical process of experiencing pain. I not only loved researching and preparing this short presentation, but I loved giving it too, and it was a revelation to me that the rest of the group listened, seemed to find it interesting and know what I was talking about. That was the start. Since then I have taught across all the age sectors, and also been a teacher trainer in Higher Education. My ideas about how to give presentations, how to teach and more importantly how I learn, have of course significantly changed over the years, as you would expect. As others have noted, teaching is about learning. I wasn’t sure how to approach this task, or even whether to approach it at all. I ended up quickly ‘brainstorming’ the ideas that matter to me, just jotting down words as I reflected over my past experience. I then had to think about how to present these. I wanted to avoid a list (difficult as I am naturally a list person!) which would suggest some sort of hierarchy, but equally I didn’t want a map. I have been thinking about Mondrian since I went to see an exhibition of his work at the Tate in Liverpool last month. The exhibition was wonderful and whilst I was already familiar with Mondrian’s work, I had not thought before about the possible significance of the horizontal and vertical lines in his later work for my thinking about teaching and learning. For Mondrian these horizontal and vertical lines related to the elements of masculine and feminine in the world around him. He was looking for balance, equilibrium and harmony, but not symmetry. 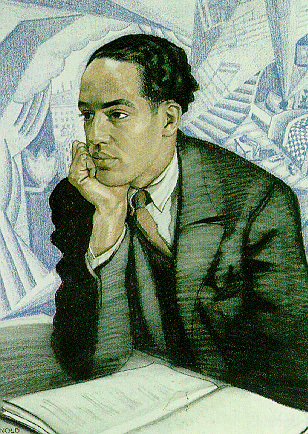 He was also concerned with space and in particular ‘empty’ space and the duality of opposing elements. For me all these ideas relate to breadth and depth in teaching and learning and the work of the right and left brain (see Iain McGilchrists work on the divided brain). They also make me think about open spaces and multiple paths for learning. 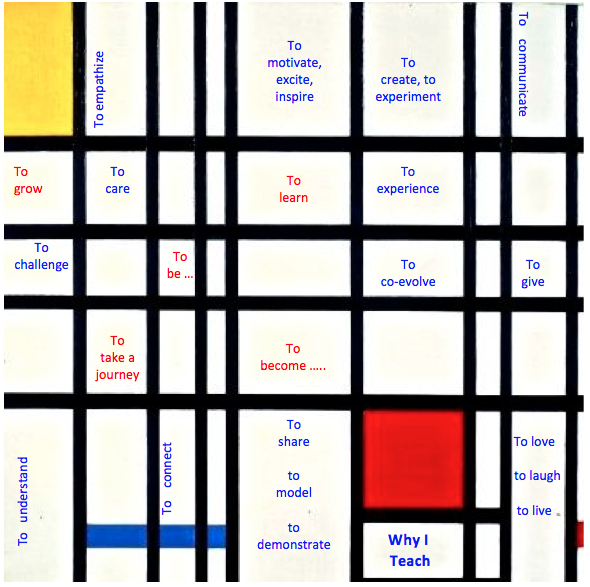 So Mondrian’s painting – Composition with Yellow, Blue and Red 1937-42 – seemed like an appropriate fit for some of my thoughts about why I teach. This question has been posed in Unit 1 of the Connected Courses. Active Co-Learning in Higher Ed open course. There have been lots of interesting responses to the question. See the Googledoc created by Helen Keegan. Why create your own space, domain, host? Why open learning? Why create your own space, domain, host? Why use your own tools? Why be a node on the web? Why is this important? What does connected learning mean? One of the attractions of this course for me, apart from all the well recognised names that are running it, is the question ‘Why create your own space, domain, host? I have been aware of the Reclaim Your Domain discussions for quite a while, and have had a ‘should I/shouldn’t I?’ discussion with myself for about the same amount of time, always coming down on the ‘I shouldn’t’ side. and for the Twitter stream use the hash tag #ccourses. From the discussion it was clear that the support will be there if I decide to go down this route – which is great – but I have yet to be 100% convinced that it is worth the time and effort. I have also recently created a GoDaddy account to host some development work we are doing in relation to our research into Emergent Learning and drawing footprints of emergence. That GoDaddy site is not ready yet to be ‘open’. From this limited experience I know that hosting your own website is a lot of work for someone like me (work that doesn’t fire up my interest) and so I was interested to read Rebecca Hogue’s post about her experience and the difficulties she encountered. But, for now, I remain unconvinced about the value of moving this blog (which I started in 2008) into a different space. What would I gain? It currently does everything I need it to do. I know it like the back of my hand – so I don’t have to think about the technology and can focus on the content. The blog itself is free, but I pay an annual fee to be able to embed videos and to stop adverts appearing on this blog. On the other hand, I know how annoyed I was recently when Flickr (where I host my photos) decided to change the way it displays photos without so much as a ‘by your leave’ or giving Flickr users any choice, but I didn’t end up moving my photos. I remember that at the time, Alan Levine, who is one of the Connected Courses convenors, was not very sympathetic, thinking that if I took more control and got my own domain I wouldn’t get into this situation. So, I’m still undecided about whether to move this blog and not ready to jump just yet. I think I would like to be clearer about what I stand to lose. I think I know what I stand to gain, but of course I appreciate that I can’t know what I don’t know, so I’m keeping an open mind and hoping to gain greater insight in this course.